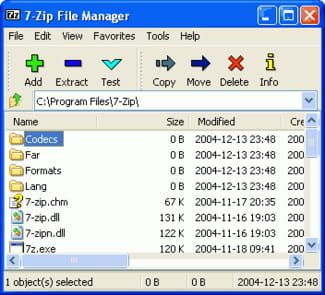 7-Zip is a software especially designed for file compression. It is capable of compressing file with a higher rate. 7zip is easy to handle and does not require great hardware resource. 7-Zip allows a very high compression ratio with the new LZMA format. It is possible to save the compressed files in the following formats: 7z, ZIP, GZIP, BZIP2 and TAR. 7zip can make an archive from the context menu and users are allowed to create self-extracting files for easy retrieval. This program can also decompress the following file formats: ARJ, CHM, CPIO, CAB, DEB, DMG, HFS, ISO, LZH, LZMA, MSI, NSIS, RAR, RPM, UDF, WIM, XAR and Z. This feature avoids having to use another program. File encryption is also at users' disposal. A password is required to do so. Only registered files under zip and 7z format files can be encrypted. The encryption uses AES-256 for preventing piracy. Apart from the features mentioned below, it is also featured with a self-extraction capability for all 7z formats, File Manager, plug-in for FAR manager and its integration with Windows Shell. 7-zip is a very effective for compressing and decompressing files. Compatible with a wide range of formats for decompression. It is not compatible with Windows Vista. 7-Zip is also available on Portable. Latest update on November 20, 2016 at 04:31 PM.